When the summer 2013 anime season started early last month, I told you a little bit about each anime and where to watch them. 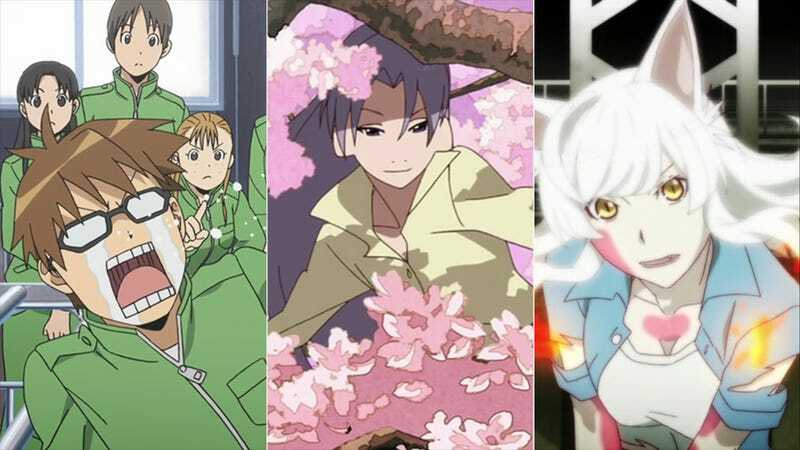 However, with 36 new anime available to watch this summer, that raises the question: Which of them should you be watching? Now, as we hit the half-way point of the season, I have finally emerged from my dungeon fully caught up on all the most well-recommended anime (special thanks to the readers of TAY and ANI-TAY) and a few others that just happened to catch my eye. Also, keep in mind that these are simply the anime that should not be missed this season. There are many more airing currently that are perfectly watchable, but these are a clear cut above the rest. Non-Spoiler Plot Summary: Modern Kyoto is filled with three different kinds of creatures: the shape-changing Tanooki, the high flying Tengu, and normal humans (who aren't even aware of the other two). Yasaburo is the middle child of a renowned Tanooki family—though he couldn't care less about his status. He'd rather just wander around town in the form of a school girl; visit his old Tengu teacher; or play a dangerous game of cat-and-mouse with Benten, an old lover-turned-enemy—who may just cook him in a pot and eat him if the whim takes her. Why You Should Watch it: The Eccentric Family has a colorful cast of characters and showcases a fantastical world happening within the shadows our own. The question of what exactly happened between Yasaburo and Benten permeates the series and makes her into one of the most mysterious and intriguing characters in anime. But beyond that, the whole series is tied together with the kind of mystical whimsy you tend to find in only the best of Ghibli movies. Non-Spoiler Plot Summary: Running away from his life in the city, ordinary student Yugo enrolls in an agriculturally focused high school deep in rural Japan. There he finds that his city upbringing has left him woefully unprepared for a whole new world filled with farming, ranching, and the occasional cow. Why You Should Watch it: Silver Spoon is a show about challenging misconceptions—both Yugo's and your own—when it comes to farming and ranching in the modern world. Moreover, it is one of the few anime out there that actually manages to teach you something and make it entertaining at the same time. And while it is clearly set up as your typical fish-out-of-water comedy mixed with a slice-of-life tale, it is never over-the-top in either its comedy or drama. Non-Spoiler Plot Summary: One day, God abandoned the world. Now, 15 years later, no one can die—that is unless a special type of person, known as a gravekeeper, buries them. This is the story of a young gravekeeper who sets out into the world, hoping to bring eternal peace to those who need it. Why You Should Watch it: Sunday Without God presents a serious fantasy tale in a post-apocalyptic world unlike any other. It takes great pains to explore the multitude of implications in its world without death—be that the love/hate relationship that the remaining humans have with gravekeepers or the changes in human society when a large portion of the population is quite literally rotting away (as they long since should have died). But beyond the setting, this anime is one of the few that realistically portrays a young girl as the lead. A girl whose sheltered upbringing and youthful optimism often depressingly clash with the reality of the world around her, while at the same time bringing a measure of hope to the hopeless. Non-Spoiler Plot Summary: The universe is a dangerous place filled with millions of worlds and countless dangerous aliens. Luckily Earth has the Gatchaman to protect us from the shadows. When a new enemy secretly comes to Earth, young eccentric teen Hajime must join the team and battle for the fate of our planet. Why You Should Watch it: Gatchaman Crowds presents a world in the near future where social media has turned being good into a game. Help a person who is having trouble at home? 300 points. Help a person who has gotten into a car accident? Get 500 points. It then explores the question, in such a world, is there really a need for super heroes? And beyond that, Hajime is an excellent female lead. While in many ways she appears simply insane, she may, in fact, see the world far more clearly than everyone else. And in a day and age where super heroes all seem to be dark and gritty, the sheer amount of fun she has in simply being one is a joy to watch. Non-Spoiler Plot Summary: Our world is filled with spirits, gods, vampires, mystical priests, curses, and all kinds of supernatural occurrences we never see. Surrounded by all this, a young high schooler named Araragi finds himself driven to help those entangled with the supernatural, while at the same time living a (somewhat) normal life and finding love. Why You Should Watch it: Monogatari is an excellent character-driven anime. The characters are complex and multifaceted and each supernatural situation they are thrown into not only develops them but also lets us experience their rich backgrounds first hand. Moreover, the art style is beautiful, with an excellent use of light, shadow, and solid colors that keep the anime visually exciting even when nothing is happening beyond a lengthy chat between two characters. And while lengthy conversations—often about things only loosely connected to the overall plot—are quite commonplace, this is in no way a downside as Monogatari is hands-down one of the most cleverly written anime out there. Now that you've read my recommendations for what anime you should be watching this summer season, you may wonder why your favorite series is absent. There are four potential reasons: (1) I think it is terrible (or just plain average); (2) it is the second/third/fourth season of an anime and I haven’t seen the first; (3) it is an anime continuing from last season; or (4) it simply didn’t cross my radar. Oh, and if you need even more anime, be sure to check out the five anime of spring 2013 you should have watched.